Well, it is with great sadness that I say I will be closing the Lilcottageshoppe, last year pretty much wiped me out, and there are no funds left for inventory, but 2008 brings new beginnings, and my new business, Retroboutiques.com is now in full swing. I will be adding all new designs in the next week, and have 5 sites in progress as we speak...so, if you are in need of a site, please visit my new blog at .. http://retroboutiques.blogspot.com/ (which by the way, still has Christmas decorations up :), and stop by my site at www.retroboutiques.com. Another another sad note, our friend Mary, from Isabella's closet is ill and in financial need. This woman, who has given so much of herself to everyone else, is too proud to ask for help. http://retroboutiques.blogspot.com, read the details, and bid on a site for Mary...payment will be paypaled directly to her at the auction end! Come on, we need to pull together to help our precious Mary! Hugs to what you are doing for her ! I'm sorry that I haven't visited lately and I am even sorrier to see that you are closing the shoppe. I know how it is being forced back into the workplace and the need to find balance thereafter. It doesn't leave a whole lot of time for fun but it looks like you're keeping a creative outlet with the website biz. I wish you much success with that! Chin up girlfriend, one door closes, another opens and all that jazz. If you're anything like me which I think you are, we're always looking for creative, entrepeneurial outlets that we totally love...its there, just keep your eyes open! Hi Arlene.....so sorry you are having to close your boutique but life does have a way of changing things for us. I'll try to visit your blog more often and keep up with what you are doing. Best of luck with all you do! I was just thinking of you and thought I would pop in for a visit. I am so truly sorry that you have to close Lil Cottage Shoppe. I know you put your heart into it for so long. But your new site will be wonderful. You are so talented and a good person. And good things come to those who wait. Thank you for mentioning Isabella. I will go to her site. So sorry she is going through a difficult time. I will keep you both in my prayers. I wish you all the best Arlene and please keep in touch. Stopping by to say hello. I miss you sooooooooooooo much Arlene. How have you been? Well, just wanted you to know I was thinking of ya!!! Just stopping by to Wish You a WONDERFUL HAPPY HAPPY JOY JOY MOTHER'S DAY!!! I am so sorry that LilCottageShoppe will be closing but you are a winner at whatever you do! You are so strong and talented. I love your website designs and I love you too. Helping your friend Mary is a wonderful thing. She has a real friend in you. Enjoy the change of seasons dear friend! Arlene, I do not know if you will get this, I sure hope so.. I tried to leave 2 other messages on your retro site but it would not let me so I thought I'd come here.. I've been wondering how you are? I know what a very hard time this must be for you & I want to say you have been in my thoughts & prayers. I do understand what you are going through. Please email me if you have a second to let me know how you are doing. My heart truly goes out to you! 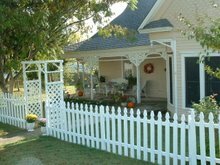 Great article, I have my own blog www.homesweethomeblog.com. I would love to add you to my blog roll and hope you will do the same - let me know your thoughts. I am also part of www.ShesConnected.com you should check it out and add your profile, it's a great way to promote your business and blog. I wanted to spend a minute to thank you for this article.